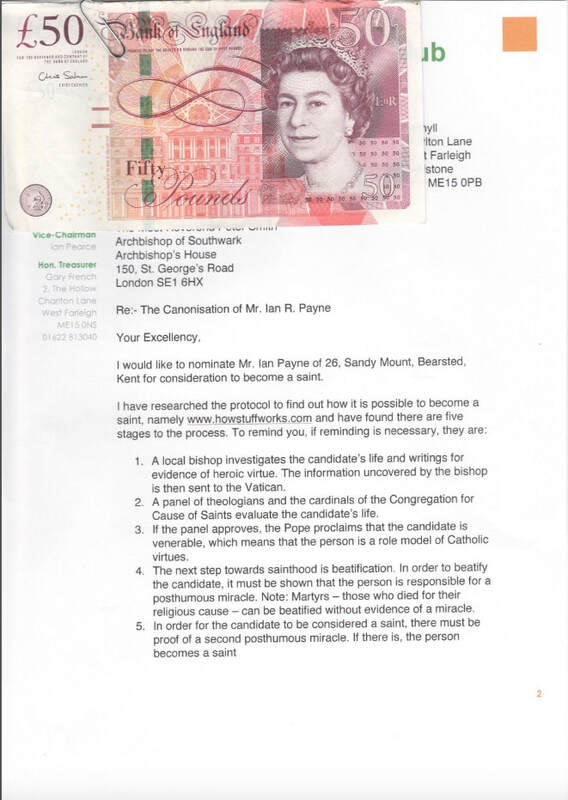 I would like to nominate Mr. Ian Payne of 26, Sandy Mount, Bearsted, Kent for consideration to become a saint. A local bishop investigates the candidate’s life and writings for evidence of heroic virtue. 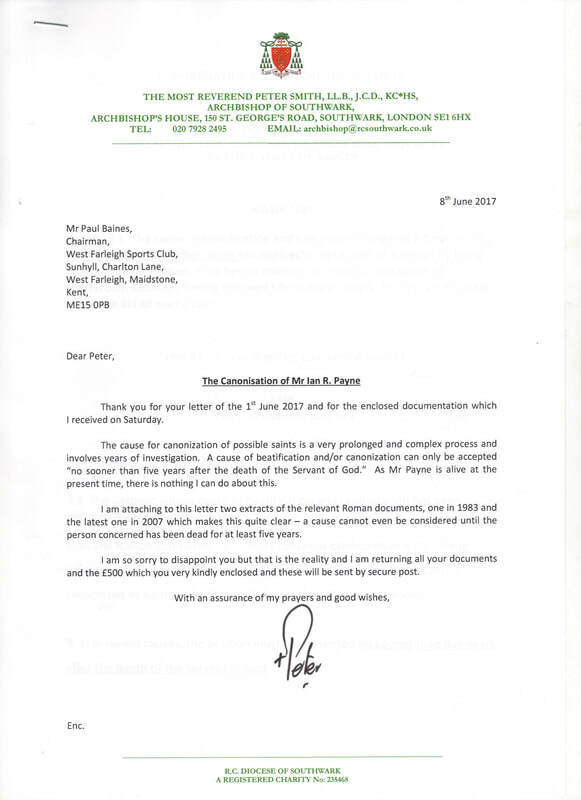 The information uncovered by the bishop is then sent to the Vatican. A panel of theologians and the cardinals of the Congregation for Cause of Saints evaluate the candidate’s life. If the panel approves, the Pope proclaims that the candidate is venerable, which means that the person is a role model of Catholic virtues. The next step towards sainthood is beatification. In order to beatify the candidate, it must be shown that the person is responsible for a posthumous miracle. Note: Martyrs – those who died for their religious cause – can be beatified without evidence of a miracle. 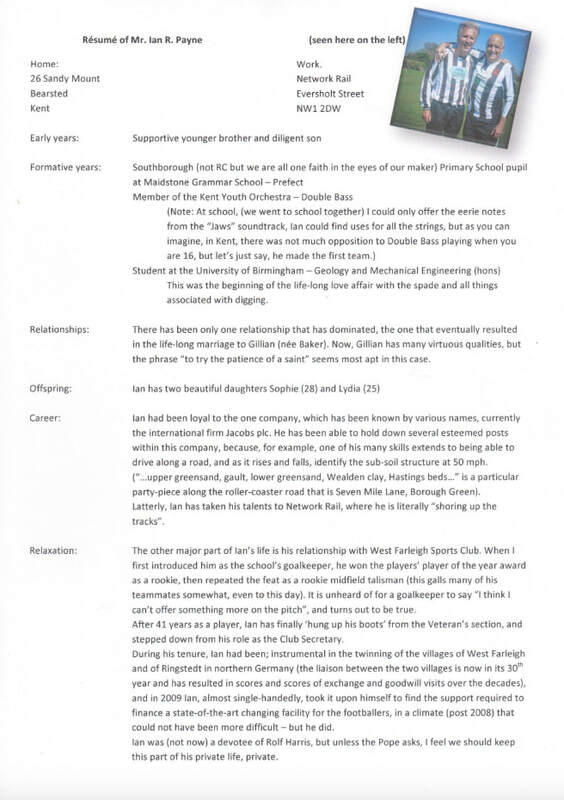 Therefore, to ‘get things rolling’ I attach a short résumé of Ian Payne along with some writings. I see that these will need to be sent to the Vatican, so I enclose a SAE for this purpose. Now, hopefully that will get us through the first three hurdles, but perhaps you have already foreseen it is going to be the last two that may cause us some difficulties. 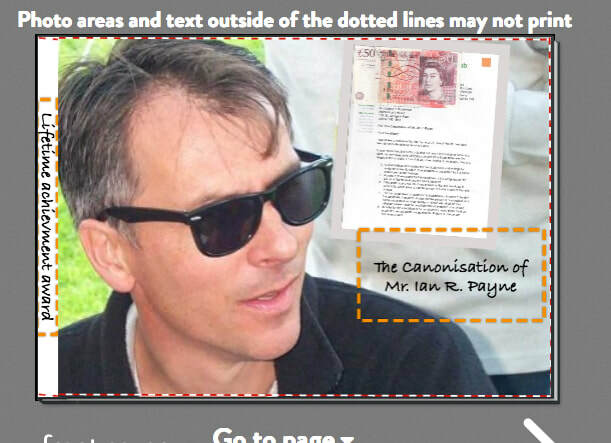 Namely, Mr. Payne is a 57 year-old, in very good health, and secondly, the act of performing two miracles. If I may (in remembrance to the late, great Eric Morley) take them in reverse order; “miracles’ is surely a subjective one; one man’s ‘miracle’ is another’s ‘stroke of good fortune’. I like the quote in “Bruce Almighty” (1) where Morgan Freeman – he plays God – says “…parting your soup is not a miracle, Bruce, it’s a magic trick. A single mom who’s working two jobs and still finds time to take her kid to soccer practice, that’s a miracle. A teenager who says no to drugs and yes to an education, that’s a miracle…”, now, if this is the true essence of miracles, I think I can say, our man ‘has it in spades’. Then, as for the posthumous problem, we can take heart that Pope John Paul II did away with the “five-year rule” (2) so as to get Mother Teresa on the list early, if this trend should continue, a 57 year old in the prime of life must surely be the next step, so I say, let’s get going on this straight away! Should all go well, we would be happy to host the canonization ceremony here at West Farleigh on the evening of Friday, 29th July 2017. We are also free, the following day (evening only) as the club is on a (sporting) tour of Canterbury, but I can foresee complications with that. Please contact me at your earliest convenience with any progress you have made. A small donation (£50) for a charity or good cause of your choice. “Bruce Almighty” (2003) – A classic Hollywood motion picture, “a bit like “Ben Hur” but without the chariots” – I think I have read that somewhere. 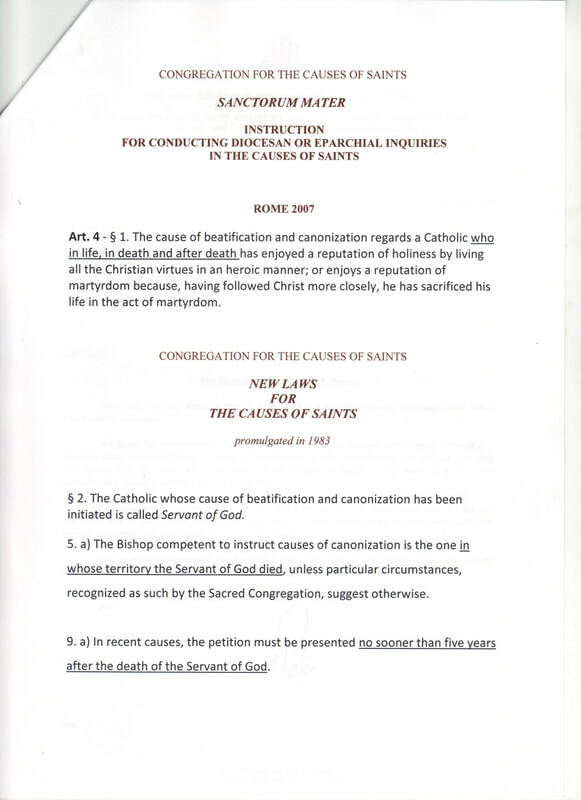 “The five-year rule” – Previously, you had to have been dead for five years before being able to be considered for canonisation. This was the beginning of the life-long love affair with the spade and all things associated with digging. Relationships: There has been only one relationship that has dominated, the one that eventually resulted in the life-long marriage to Gillian (née Baker). Now, Gillian has many virtuous qualities, but the phrase “to try the patience of a saint” seems most apt in this case. Career: Ian had been loyal to the one company, which has been known by various names, currently the international firm Jacobs plc. He has been able to hold down several esteemed posts within this company, because, for example, one of his many skills extends to being able to drive along a road, and as it rises and falls, identify the sub-soil structure at 50 mph. (“…upper greensand, gault, lower greensand, Wealden clay, Hastings beds…” is a particular party-piece along the roller-coaster road that is Seven Mile Lane, Borough Green). Latterly, Ian has taken his talents to Network Rail, where he is literally “shoring up the tracks”. 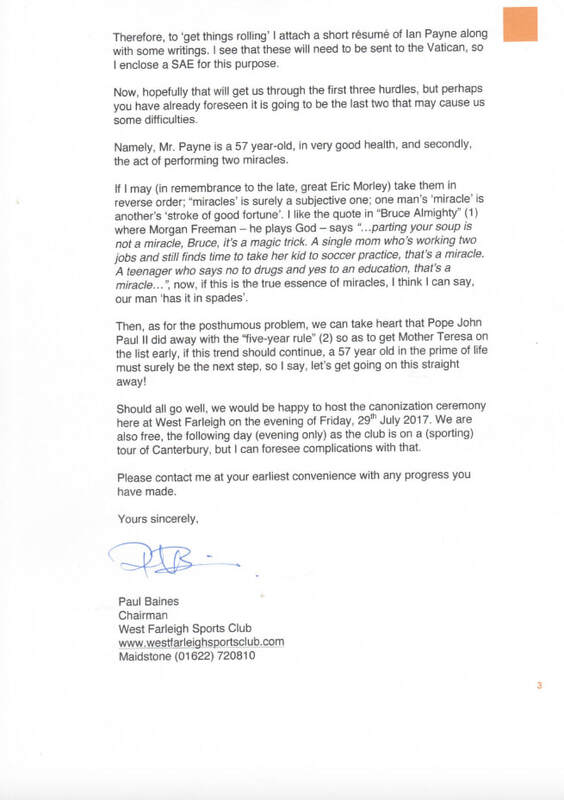 Relaxation: The other major part of Ian’s life is his relationship with West Farleigh Sports Club. When I first introduced him as the school’s goalkeeper, he won the players’ player of the year award as a rookie, then repeated the feat as a rookie midfield talisman (this galls many of his teammates somewhat, even to this day). It is unheard of for a goalkeeper to say “I think I can’t offer something more on the pitch”, and turns out to be true. 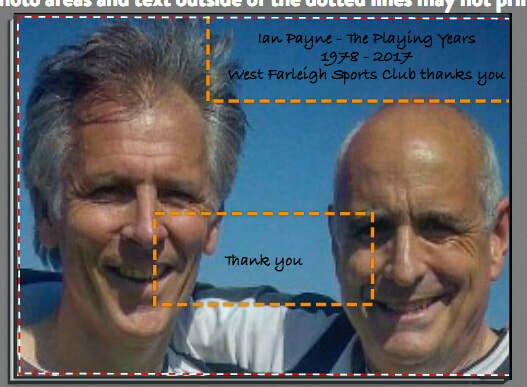 After 41 years as a player, Ian has finally ‘hung up his boots’ from the Veteran’s section, and stepped down from his role as the Club Secretary. and in 2009 Ian, almost single-handedly, took it upon himself to find the support required to finance a state-of-the-art changing facility for the footballers, in a climate (post 2008) that could not have been more difficult – but he did. Ian was (not now) a devotee of Rolf Harris, but unless the Pope asks, I feel we should keep this part of his private life, private.